After arguably some of the worst few weeks in the club’s history, the Wests Tigers are in need of a new direction and a complete cleanout. Changes obviously need to be made in administration, but the playing group must accept some of the responsibility for the club’s issues. I sat back and watched the events of the past few weeks and noticed a perennial presence in any news story about the Wests Tigers: the ‘big four’. Firstly, the fact that people are calling them the ‘big four is absolutely ridiculous. These players are undoubtedly talented, but have not performed adequately enough to be called ‘big’. In fact, aside from Aaron Woods, they have barely accomplished anything big at all. James Tedesco’s sole NSW Origin appearance came last year, and he isn’t even guaranteed a spot on this year’s team. Luke Brooks is a young player with immense talent, but he is riddled with inconsistency and prone to errors. 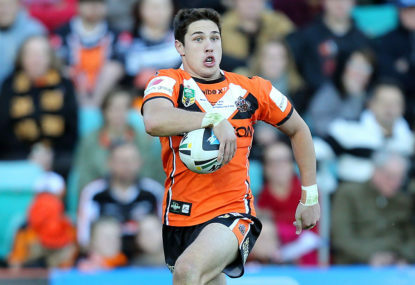 Mitchell Moses is in similar vein, and although he is solid, he is by no means anything more than a decent first grader at this point. These players have been an unnecessary distraction for a club plagued by myriad other issues. Not only have they disrespected the administration, but the fans of the club should be angered by the way these players have also disrespected them. Woods’ demeanor during some of his on-screen interviews has been appalling. Woods has a responsibility as the team’s captain and leader to take things seriously. He has compounded the problems by the way he has approached interviews and questions about his future. He has wronged the Tigers and their fans by publicly commenting on his protracted contract negotiations, and expressing his desire for the club to appoint a new coach before recommencing his negotiations. These comments are fair in private discussions, but they should not be aired publicly. I get the sense that these players, puppeteered by their management, just don’t care about the club. I sympathise with Tigers fans. The chances of the club retaining all four players were slim enough as it was, and these recent events have made it even more unlikely. I would say that’s good news for you Tigers fans. The big four, as a group, should not be retained. The focus should be to acquire leaders and players who can consistently deliver on their talent.